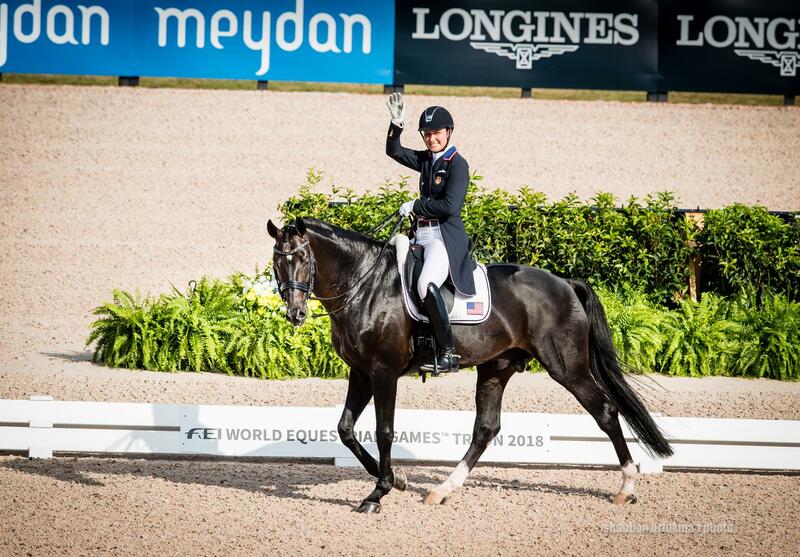 Mill Spring, N.C. – The first two combinations of The Dutta Corp. U.S. Dressage Team, led by Chef d’Equipe Robert Dover, set the tone for the U.S. team competition in the U.S. Trust Arena at the FEI World Equestrian Games (WEG) Tryon 2018 on Wednesday. Adrienne Lyle with Salvino and Steffen Peters with Suppenkasper produced two bold tests on the first day of competition, earning individual scores of 74.891 percent and 73.494 percent, respectively, placing the U.S. team in bronze-medal position with a current team score of 74.860 percent. 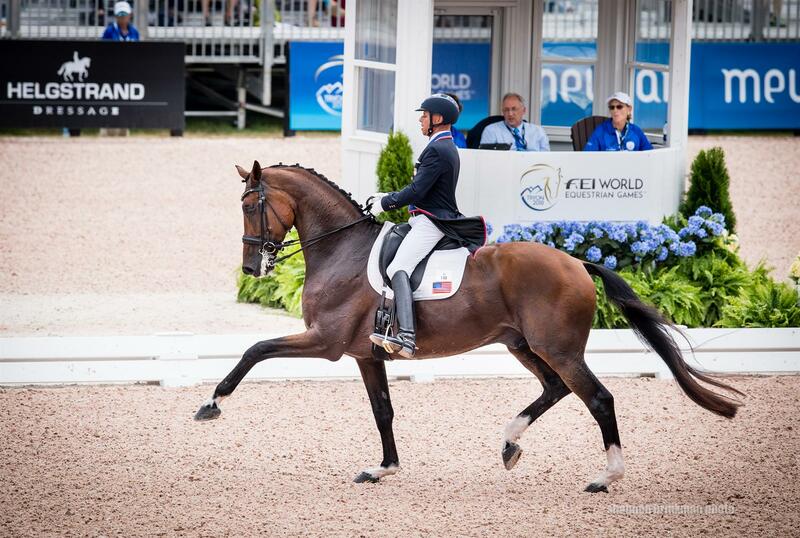 Four-time Olympic veteran Steffen Peters (San Diego, Calif.) and Suppenkasper, Four Winds Farm’s 10-year-old KWPN gelding, set a positive start for the U.S. team. The judges awarded high marks on the extended trot work, tempi changes, and final halt, helping them earn a 73.494% to move forward to Friday’s Grand Prix Special. “[Suppenkasper] was a bit nervous coming into the arena. I was very happy in how he handled this because it was a huge step-up from [CHIO Aachen] with relaxation,” said Peters. “I could push the extensions, which is new for us. He did beautiful pirouettes today. The changes felt nice and forward for a young kid. Olympic veteran Adrienne Lyle (Ketchum, Idaho) and Salvino, Betsy Juliano LLC’s 11-year-old Hanoverian stallion, were the second and final U.S. team combination of the day to dance down the centerline. The combination’s composed approach in the transitions were the key to success, earning them a 74.891 percent. Competing for a team medal and team qualification for the Tokyo 2020 Olympic Games, team support at the WEG is paramount. “Robert [team Chef d’Equipe] and Debbie [McDonald] create such a supportive atmosphere. It’s a team effort. I’m happy we got a solid score for our team. That’s the most important thing in coming here; it’s the team competition,” said Lyle. Fellow teammates and Olympic veterans Laura Graves (Geneva, Fla.) with Verdades, the 16-year-old Dutch Warmblood gelding she owns with Curt Maes, and Kasey Perry-Glass (Wellington, Fla.) with Goerklintgaards Dublet, Diane Perry’s 15-year-old Danish Warmblood gelding, will ride in the final rotation of the Grand Prix on Thursday, September 13, when team medals will be determined. Germany leads the team competition with an overall score of a 76.677 percent followed by Sweden with an overall score of 75.248 percent. Competition continues Thursday, September 13, at 8:45 a.m. ET in the U.S. Trust Arena, with the remaining combinations competing in the Grand Prix.